The chicks have hatched, and with seventeen active and healthy, a great result. Most are from eggs I purchased from Ameraucana breeders in NJ and PA. They hatched well even after traveling through the mail. Some years none of the eggs I’ve gotten through the mail have hatched. 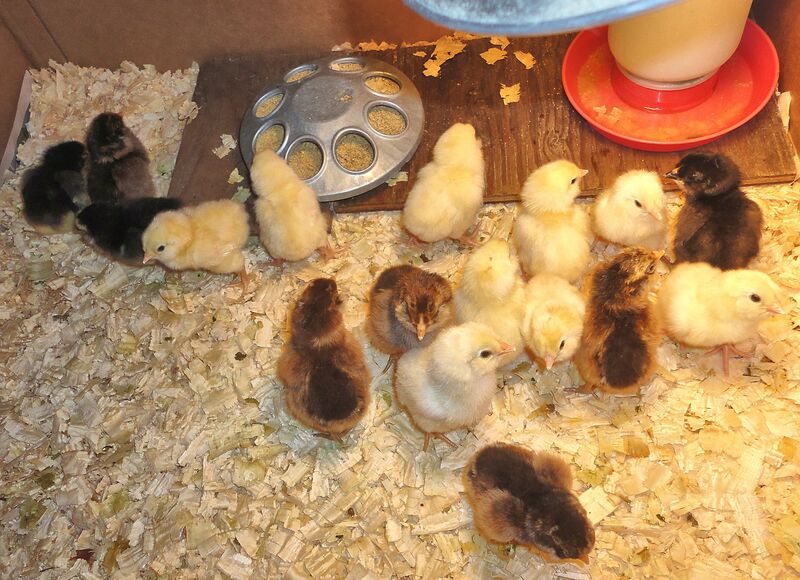 Most of the chicks are wheaten or blue wheaten color, they are the yellow babies. There are a few blacks or blues, some brown reds and maybe a silver. We’ll see exactly what colors are there when they feather out. Most have already survived two days. 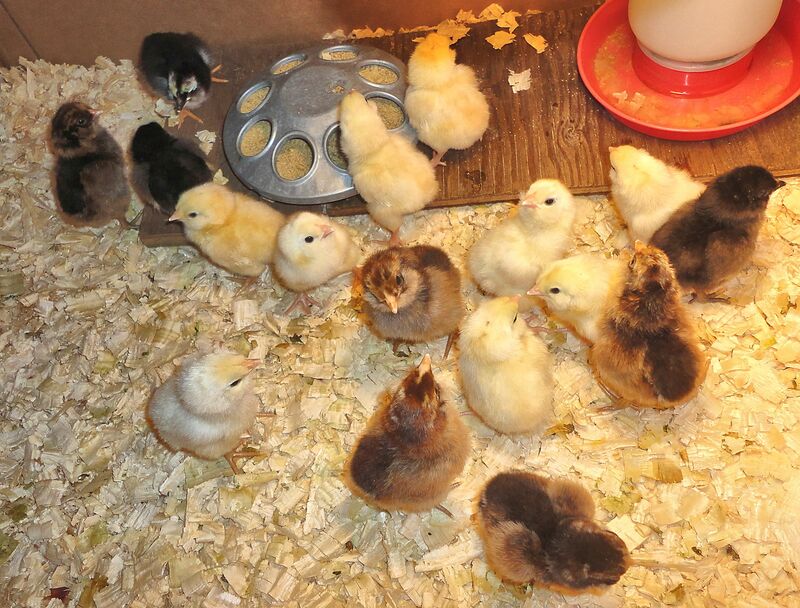 The first three days are the most likely time for a newly-hatched chick to die. Ones that make it three days usually live to adulthood. These little guys are sassy and active and eating well. They think I’m their mother and come running when I call them. The babies can hear inside the egg so I begin talking to them as a mother hen does, well before they hatch. A mother hen speaks to her chicks with a soft, low, rapid, buck-buck-buck, clucking. She also makes a purring sound in her throat that means all is well, we are content, go to sleep. Chickens make this sound their whole lives when it is time to sleep. On about day 18- 19 of egg development, the babies turn their beaks into the air cells of the eggs, begin breathing air and can make sounds. They will answer me when I talk to them like a hen. By the time they hatch, they are looking for momma, and they see me talking to them. When I make the contented sound, they copy me and settle right down. By the time the babies are grown, they are very attached to me and follow me around. I enjoy being a mother hen.